HA! I totally just put THAT song in your head for the rest of the day. Oooopsies! *Insert big toothy grin here. * BUT, we are ACTUALLY at Sketch #99 with Skipping Stones Design and I think that's rather exciting, personally. We have really had a fantastic month of sketches and this last one is no exception! Being that it is, indeed, October, I HAD to pull out the Cancer Schmancer set for this week's fabulous sketch. As many of you know, my friend, Chris, lost her battle with breast cancer not too long ago. However, Chris was strong and she fought that disease with everything she had! Right now others are fighting. The difference is that many of them...most of them, even, will win! I think it's important to gather the strength from those who fought and carry that forward to continue this fight for those who are still here. We can beat this! Hope Happens!!! This is such a great stamp set. So encouraging and so uplifting! And the sketch is fantastic, too. Soooo...that means it's homework time! YOU, yes YOU, need to head on over to Skipping Stones, check out the inspiration that the Stamp Tramps and our guest designers have created for you and then link up your own card!!!! You don't even have to use SSD stamps, but you could win some for free! You know you want to play, so just do it! It will make you smile. Just say'n. ummm, thanks for the song, geez LOL Fabby card!! Great CAS card and perfect for this month!! LOVE this card. It's awesome seeing everyone covered in PINK for the Ta-Ta's. This is a simple card that makes such a HUGE statement J...excellent job!! Now...seeing as I have a catchy toon in my head..I will go work on some more mummies. thanks sooooo much for the song. Ugh. A friend of mine was just diagnosed with a terminal illness, and it is so hard to know what to say. I think this might be one of the few appropriate sentiments out there. 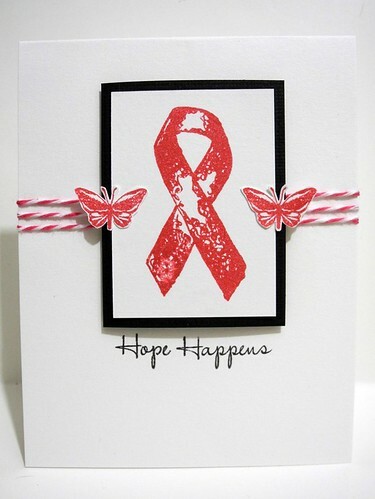 love the message and a sweet card with a great design! Love the card! It is simple and clean with straight lines and I love that. That stamp set is great! I love that stamp set. I've seen it but do not have it. Think I might need it now. Such a great way to support those we love and encourage them. Love the twine! That is truly such a lovely card...great work, Jingle! Oh dear, I fear that I will have that son in my head for a while now! Hah! Great card, great message. 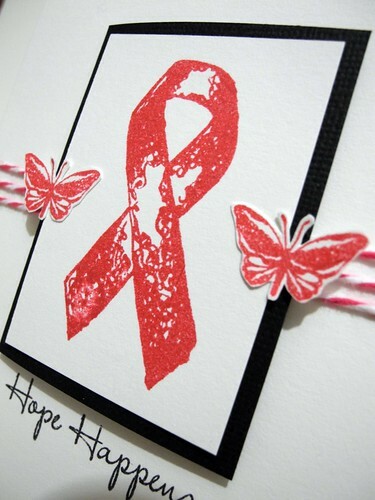 Love your card, for such a great cause. The twine on it is really fun! LOVE this! This is a cause near and dear to me. :) So special. Your card is awesome, however the song is not appreciated....lol..
That is a great card and good reminder. Sorry for the loss of your friend. Endearing!!! great work...really very sorry for your friend. This is soo simple and perfect Jen!!! I love the colors. I really need to use Cancer Schmancer more!! I hope you have a good weekend! Would you like a piece of candy??? It's Time for a Halloween Hop! How about a Quick Halloween Card for the Weekend? Samantha Walker Creative Team October Blog Hop! A Friday Full of Fun For Friends wit Flair! It's Pixie Dust Challenge Day! It has been ONE Productive World Card Making Day!